Twitter goes public today as shares in the company start trading on the New York Stock Exchange. And if you are like 8% of U.S. adults who use Twitter to track news, you might be among those following developments about the IPO on Twitter. Twitter has over 230 million monthly active users, with 77% of its accounts outside the U.S. About three-quarters of Twitter users access the site through mobile devices. All in all, 500 million Tweets are being sent each day, according to the company’s website. A Pew Research Center survey conducted Aug. 21 – Sept. 2 found that 16% of U.S. adults use Twitter and roughly half of that number consume news there. Close to half of those Twitter news consumers (45%) are young people, ages 18 to 29, compared with 34% of Facebook news consumers in the same age group. Young people also stand out as a group who have increasingly turned to online sources for news. For the overall public, those who cite the internet as their main news source climbed from 13% in 2001 to 50% today — more than radio (23%) and newspaper (28%) but less than television (69%). 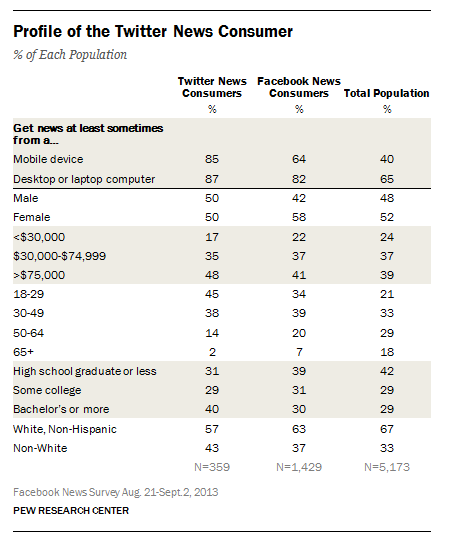 But for young people, 71% say the internet is their main source of news, in contrast with 18% of those 65 and older.